Edgar Pangborn was awarded the Third Annual Cordwainer Smith Rediscovery Award at Worldcon in Toronto. 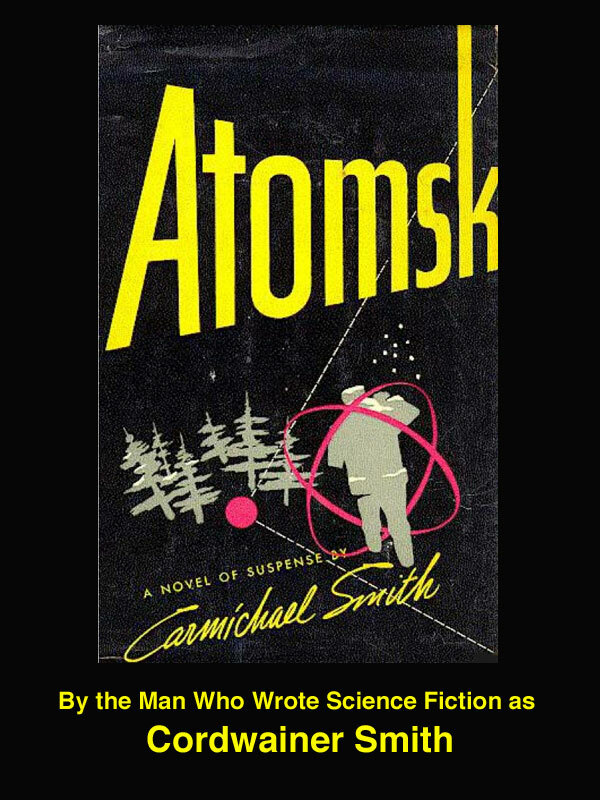 He joined Olaf Stapledon (2001) and R. A. Lafferty (2002) in receiving this award, given to a "science fiction or fantasy writer whose work displays unusual originality, embodies the spirit of Cordwainer Smith's fiction, and deserves renewed attention or 'Rediscovery.'" Jurors for the award were four of the most distinguished and encyclopedic minds in contemporary science fiction, all Hugo winners themselves: Robert Silverberg, Gardner Dozois, John Clute, and Scott Edelman. They were free to choose any writer, living or dead, for the Award. What did Edgar Pangborn write? 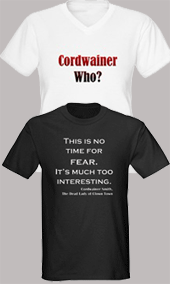 His best-known science fiction is West of the Sun, A Mirror for Observers, and the Davy books. There's a list of everything he wrote at the Fantastic Fiction website. West of the Sun, Pangborn's first science fiction novel, came out in 1953. Happily, Old Earth Books brought West of the Sun back into print in 2001, and they intend to republish all the Pangborn science fiction. I read West of the Sun after learning that Pangborn was going to be awarded the Rediscovery Award for 2003. I enjoyed its reflective qualities especially. The characters became real to me, and I cared about what happened to them even though the war part went on a bit long for my taste. I found the ending quietly hopeful in a way that I could resonate to. There is a lot of love in Pangborn, along with a keen awareness of human stupidity. Resonated with that, too! As the explorers land on a planet that has not one but two races of men who soon learn English, I mutter, "Yeah, right." But as Pangborn wonders about human nature, I am right there, loving how he expresses some of my own deepest feelings. "Edgar Pangborn was one of the greatest American science fiction writers, who established along with Bradbury, Sturgeon, Miller, and Cordwainer Smith a poetic, beautifully human style of science fiction. Pangborn's evocative landscapes and intense emotional situations combine to give all his novels a mysterious and powerful beauty. He was a true artist and bringing his work back into print in this way is a great moment for American literature." —Kim Stanley Robinson, on the front cover of the Old Earth edition. West of the Sun is available at Amazon.com. 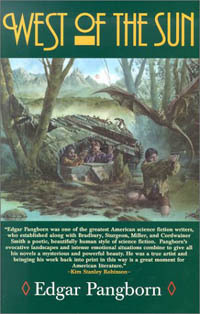 Pangborn's second novel, A Mirror for Observers, won the International Fantasy Award in 1954. Many consider it his greatest novel. As I haven't read it, I won't try to summarize its plot. A Mirror for Observers is available at Amazon.com, and there are some thoughtful reviews there. In Davy, Edgar Pangborn tells the story of the central character's life in retrospect, skipping around from one phase to another. The story reminded me of my father's writings in that way -- both Pangborn and Cordwainer Smith will tell you things near the beginning that most writers would save for the end. I enjoyed Davy a lot, though at times the stupidity of society was a bit much. But then, it is a bit much out here in this "reality" too. Set in a post-holocaust northeastern former United States, Davy tells a tale that is full of human foibles and love. Again, the characters were more compelling to me than the plot. Davy was nominated for a Nebula Award in 1964 and for a Hugo Award the following year. Davy is at Amazon.com. For information on the others in the series -- which appear to be short story collections -- see Fantastic Fiction or the link about Pangborn's life in the next paragraph. Pangborn was born in New York City in 1909, and later attended Harvard and the New England Conservatory of Music. 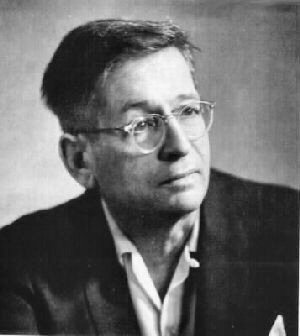 He became a farmer, served in the Medical Corps during World War II, and published his first science fiction short story in 1951. He died in 1976. For more about the life of Edgar Pangborn, click the link.